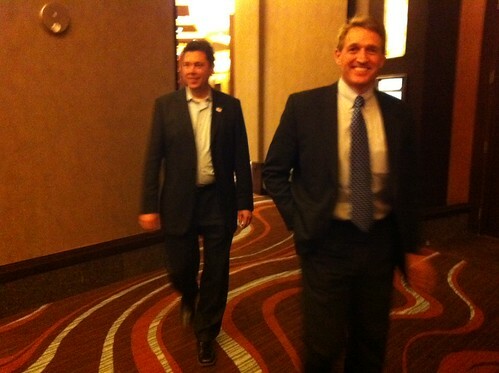 LAS VEGAS – I’m attending a caucus in the suburbs today, in one of the areas that gave Mitt Romney his 2008 landslide. A full report on that will be up later, and not too much later – in an act of pure generosity to East Coast elites and our deadlines, most of the caucuses begin at 9 a.m. local time and wrap up within 90 minutes. In the meantime, should we predict who will win? No, that’s no fun: Mitt Romney will win. If you went back and checked the 2008 polls, you remember that Romney was pegged to win around 30 percent of the vote that year. He won 51 percent, stampeding John McCain (who placed behind Ron Paul), helped tremendously by the fact that one in four voters were Mormon. Nate Silver has a smart, scientific calculus of how the candidates will do. I have a guess I’m pulled from out of the cloudless sky. Check back here later in the day, and make your own predictions. 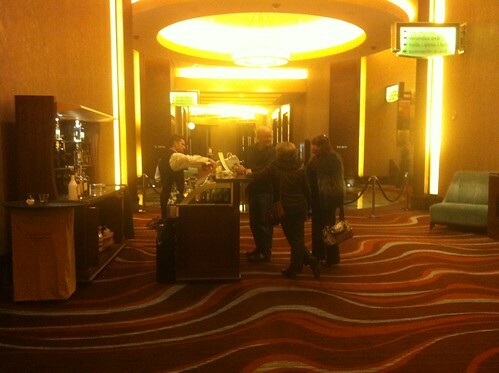 Thanks to a special caucus behind held for shabbos Jews, we won’t get an official call until 10 p.m. eastern time. If you’re really into horse-races, the dream is that Gingrich and Paul basically tie across the state, and the battle for second depends on what observant Jews think: Go with the guy who moves the embassy to Jerusalem, or the guy who wants to nix foreign aid? 6:31: It’s an early count, but CNN’s making me feel good about my prediction. The early “entrance polls” give us a Romney win and a Paul-Gingrich tie. This is more interesting: Ron Paul: The choice of liberal voters and people who want a “true conservative.” Romney and Paul are the only candidates who win any breakout groups – Gingrich is fighting for second with a bunch of decent showings in various demos. 7:36: My reporting companion Garrett Quinn and I stopped over at the Nevada GOP’s filing center, just moments before Rep. Joe Heck. The freshman Republican, one of Mitt Romney’s earliest endorsers (March 2011), was already talking freely about a Mitt win. In a short conversation with us and with CNN’s Peter Hamby, he said it was time to start winding the primary down. “I hope [Gingrich] takes the message that it’s time to withdraw gracefully and not further divide the party,” he said. What about his colleague Ron Paul? He was doing about as well as Gingrich: Should he quit? “When it’s apparent that there’s enough critical mass of delegates behind one nominee, when I think would be Gov. Romney, I think they all will.” But when would there be a critical mass behind one candidate? “I think by Super Tuesday.” 8:08: Results are now in from one of Nevada’s least populous counties, Eureka. These are total votes, not percentages. I’ve got American faith in America’s heart. Go on raise the flag. I’ve got stars in my eyes. I’m in love with Her and I won’t apologize. David follows this with a song “Gov. Romney’s quoted a few times,” called “America the Beautiful.” 10:34: In the Red Rocks Hotel to celebrate with Mitt Romney: Reps. Jason Chaffetz of Utah and Jeff Flake of Arizona, Mormons both. - “I would like to speak on behalf of Dr. Ron Paul, because he is the only candidate who would be good for the whole world.” - “I’ve watched all the debates, and sometimes, when they go on Ron Paul, the lighting is dimmer.” - “Something has to be done with the government, and the way they’re using our own men as guinea pigs!” - “We are very quickly heading down the road that the Roman empire did.” Because Gingrich’s presser was delayed by 18 minutes, this ran live on CNN for nearly 10. 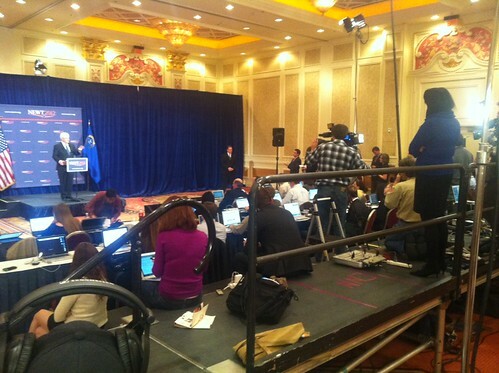 11:25: In the Bellini ballroom of Sheldon Adelson’s Venetian hotel, Newt Gingrich addresses the media. His daughter Jackie Gingrich Cushman, in the blue sweater, watches from a less-than-overflowing press riser. 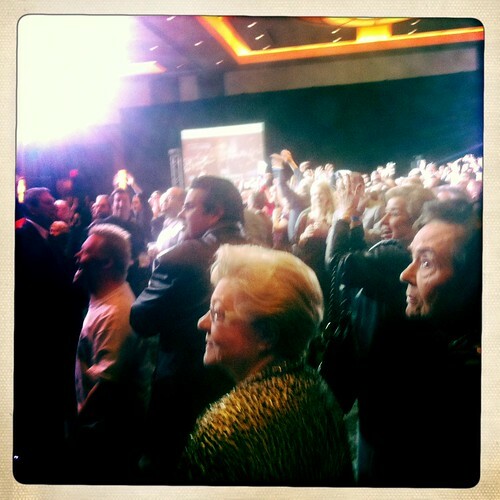 Stage left, Gingrich’s wife Callista stands, smiling at his barbs. Oh, there are barbs. Gingrich starts to leave the stage, but stops for one more personal aside. “I am strongly for the Giants,” he says. The Giants would be the team that defeats Mitt Romney’s. 12:13: If Ron Paul doesn’t dominate the second place vote Clark County, he’s going to lose to Newt Gingrich. In delegate terms, it’s almost meaningless – both men will probably end up with four of them. But it’s bad for Paul if he can’t pull second. Nevada would be the first state in which he couldn’t double his vote from 2008. His organization, which really did put down roots for four years, will have failed to overcome a generic conservative vote for a landing who had been taking on water. And Paul himself had told CNN today that he would come in second. Never do that, people.